This mid terrace property is situated close to major bus routes, schools, churches and all local amenities. Internally the property comprises of a spacious hallway, large through lounge, modern fitted kitchen, classic first floor bathroom suite and three bedrooms. This house has recently just been redecorated from top to bottom and is finished to a good standard. Externally there is secure off street parking to the front and enclosed gardens both front and rear. 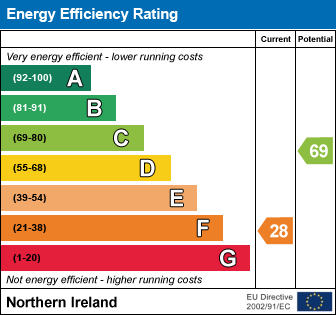 The dwelling further benefits from oil fired central heating and uPVC double glazing. Properties in Silverstream Parade are extremely rare to the market and internal viewing is strongly advised. I am interested in 24 Silverstream Parade, Belfast. Please contact me about this property.